Back with the third issue…Coitus once again provides exceptional photographic genius and top models in a splash of summer fun in “Coming of Age”. 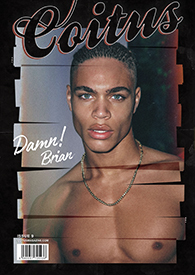 Showcasing the transition from boy to man, it brings together colour, fashion and exploration of sexuality. Jessy, Joan Mirangels, Ben Somers, Bjorn Buckley, Sam Lawson and Pablo Morais. Renato Ferreira. Fabricio Bach, Billy Morgan, Zack Durham, Francisco Escobar. Kenzie, Tom Landers. Barnaby Dunn, Alex Annand, Chris Wetmore, Samuel Tingrnan, Elliot Joseph Rentz, Marlon Eourbin, Markus Nilsson and Panos Malactos.